HE WAS A PATRIOT BY HERITAGE. And Services to N. G. P.
with the Grand Army, he had been a little more than an invalid this past year and his demise was not wholly unexpected. He leaves a wife, daughter of Alexander Bradley, the well-known manufacturer, and one child, a son, Captain Alexander B. Perchment, of Company A, Fourteenth Regiment. Dr. Perchment as born in Sterrest township, Allegheny county, in 1838, within three miles of his deathplace. His early life was passed on the farm, a grant from William Penn to his grandfather, who was a scout and captain of a company of Free Rangers in the Revolution. His father was a noted Abolitionist, and had stock in the famous underground railway. Dr. Perchment was the third of fours sons, the oldest of whom, Harry, went to Australia as a gold seeker, and afterward died. The other two, Albert and Hone, were surgeons in the war, but are now dead. Dr. Perchment was educated at the old Wilkinsburg Academy , and graduated with honors both Allegheny and Jefferson Colleges . 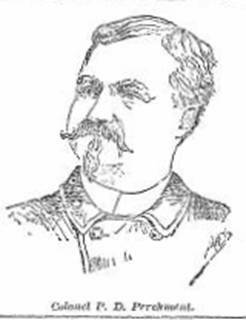 He first began to practice shortly after the breaking out of the Rebellion, when he made his second enlistment, this time as an assistant surgeon, in July, 1864. in the Seventh Missouri Cavalry, from which he as honorably discharged in August, 1865. He then began a large city practice, with his brother John, at the corner of Kirtland street , commonly called “the puzzle.” Eight years later John died and his survivor carried on the practice alone, removing to his present place on Collins avenue . Dr. Perchment’s connection with the army had been continuous since the war. He first served two years in the Fourteenth Regiment, Pennsylvania Volunteer Infantry; as a private and non-commissioned office; his connection with the Seventh Missouri Cavalry followed; and immediately at the close of the war he was elected Captain of a veteran company called the “Boys in Blue.” This position he held until 1870, when he organized the Armstrong Zouaves, also assisting Colonel Samuel Kilgore to organize the Fourteenth Regiment, N. G. P., in which he as elected Captain of Company F.
This position he exchanged 15 years later of the Lieutenant Colonel, and three years after he became colonel, which honor he held at the time of his death. His command was frequently known as the crack regiment and was the one selected by Governor Beaver for Johnstown service, and later by Governor Pattison to represent the Second Brigade at the unveiling of the Hartranft monument at Norristown , PA. Colonel Perchment was a foremost member of James McPherson Post 117, G. A. R, and of many other lodges and similar organizations. Colonel Perchment has won other honors than as a fighting patriot. He was a great Republican, and influential in his section of the city, serving four terms in Councils and being a member of the school board of the Nineteenth ward for a similar tenure. He had been a members of the poor board every since its organization and had been one of its physicians since 1868. One of Colonel Perchment’s pet projects was an armory for his regiment. He had talked the project pretty well into shape, in the hope that, before the end of 1895. “his boys” should have their own home, and had expected to assist the scheme financially to a goodly extent. Pursuant to the above order the officers met last evening and appointed a committee consisting of Colonel Hill, Major Johnston and Captain Thompson to draft resolutions of regret. The committee is to report tomorrow morning. The regiment will go home some time Friday and the dead Commander will be buried with military honors. Colonel Norman Smith, of the Eighteenth Regiment, sent a letter to Lieutenant Colonel Glen last night express the sympathy of his command. Mrs. Alwilda Catherine GRUBE, 76, of 37 Dartmouth rd., died at the Ridgewood Nursing Home at 12:30 p.m. Thursday after five months of illness. She was born in Springfield Aug. 12, 1895, a daughter of Henry and Lillie VIETS GRUBE. She was a member of Auburn Lutheran Church and Rebekal. Circle of Auburn Lutheran Church Women. Survivors include two sisters, Mrs. Effie PERCHMENT and Mrs. Dorothy KENYON; a brother, Ora GRUBE, and a niece and nephew. Services will be conducted in the Littleton Funeral Home at 1:30 p.m. Saturday by the Rev. Roland LANGFORD, pastor of Auborn Lutheran Church. Burial will be in Vale Cemetery. Friends may call in the funeral home from 3 to 5 and 7 to 9 p.m. Friday. Departed on Mar. 16, 2006 and resided in Kettering, OH. PERCHMENT, Helen A., age 103, a life long resident of Kettering passed away Thursday, March 16, 2006 at Kettering Memorial Hospital. Helen was born October 4, 1902 in Dayton, OH. Helen loved gardening and bird watching. She was preceded in death by her husband, George Perchment and son, William Perchment. Helen is survived by her daughters, Barbara .........* and Anita and her husband, ..........* Those left to cherish her memory include, 9 grandchildren; 20 great-grandchildren; and 4 great-great grandchildren. Funeral services will be held Monday, March 20, 2006 at 10:00 AM at the Routsong Funeral Home, 2100 E. Stroop Rd., Kettering, with Rev. Lawrence Rezash officiating. Burial in Dayton Memorial Park. Family will receive friends Sunday from 2:00-4:00 PM at the funeral home. Condolences may be sent to the family via the website at www.routsong.com. * I've removed some information about living persons- for privacy reasons.